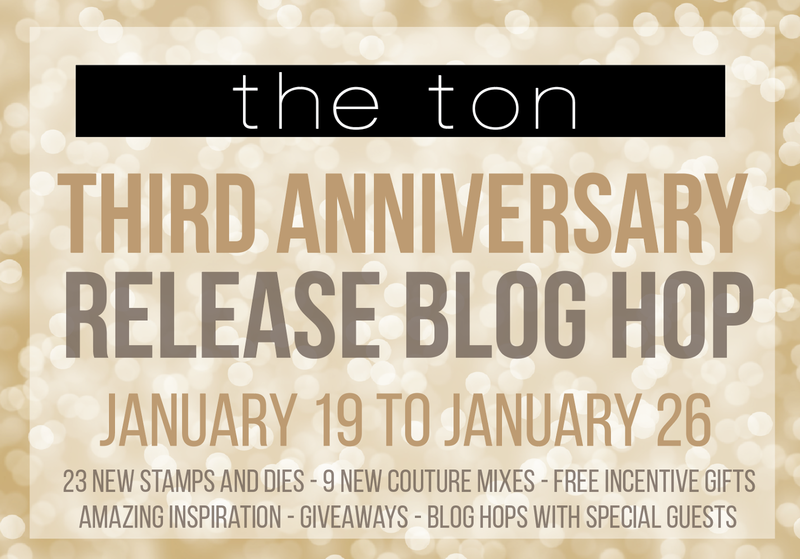 Welcome to The Ton 3rd Anniversary Release Blog hop! It's Dana here and I'm so honored to be part of this wonderful blog hop. I hope you came from amazing LauraJane's blog, but if not, please check out today's mini blog hop list in the bottom of this post. Now, it's time to get to my cards. I have 3 cards for celebrating The Ton's 3rd birthday today. Let's get started! 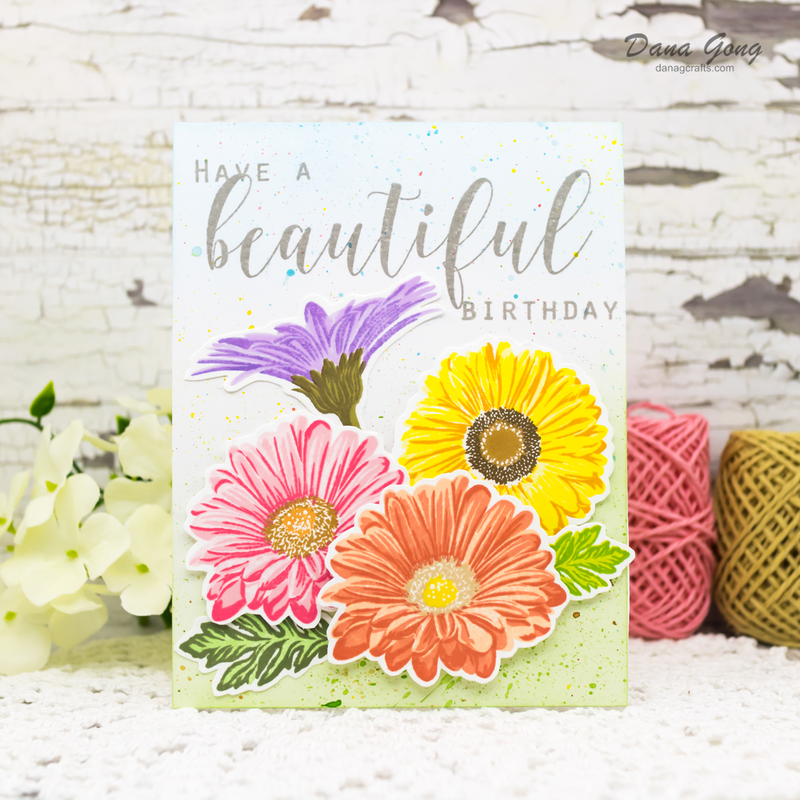 In my first card, I featured The Ton Fresh Cut Daises stamp set. I stamped each 3 layers of flower stamps and 2 layers of stem and leaf stamps very carefully onto white card stock. I fussy cut them out using scissors. I added white dots in the center of flowers using white gel pen. For background, I sponged Distress Ink, Salty Ocean, Tumbled Glass and Mowed Lawn using mini blending tool on A2 sized bristol paper. I splattered same inks with water here and there using paint brush. I then stamped sentiment from The Ton Peony Notes Bundle with light grey dye ink. I finished off this card by foam mounting all elements as shown. 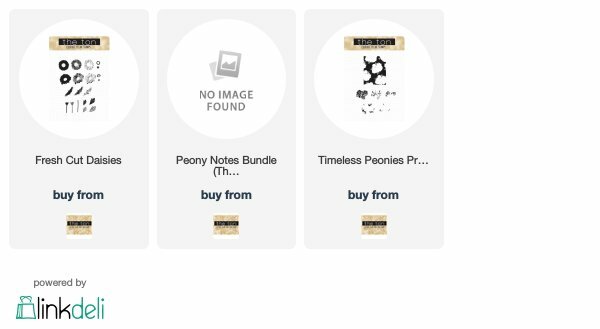 The Ton Peony Notes A+B+C stamp set is just amazing. It works so beautifully just by stamping as an original design, but I'd like to show you some fun way to use set C.
First, I stamped layered flower bouquet from set A and B using several dye inks and stamped background from set C using Distress Oxide Ink, Seedless Preserves. I then lightly taped stamped panel on my stamping tool, Tonic Tim Holtz Stamp Platform. I created stripes using post-it tape as shown in the picture and stamped set C again using Versafine Onyx Black. 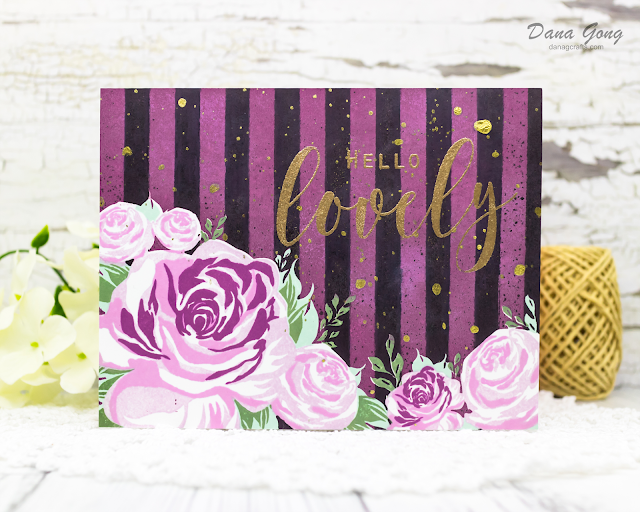 I was so happy to get a striped background easily without masking the flower image! Isn't it awesome? To finish, I gold heat embossed sentiments from same stamp set and splattered gold drawing ink here and there using paint brush. For my last card, I created a floral patterned paper using The Ton Timeless Peony Print stamp set. This stamp is so versatile to use and I made spring themed paper at this time. If you want to see my future color combo with this stamp set, please follow me on Instagram or Facebook. Peony bouquet image includes 3 layering stamps, but I stamped just two layers in most of flowers except the center one. After stamping all images, I cut floral panel as shown using trimmer and craft knife and glued it onto A2 sized woodgrain card stock. I stamped sentiments from The Ton Peonies Note Bundle onto floral panel. I white heat embossed the other sentiment from same stamp set on yellow card stock and popped it up using foam tape. To finish, I embellished some clear sequins where I wanted them. I hope you enjoyed these cards. Thank you so much for stopping by and happy hopping! Those stripes are so clever! Beautiful card! Lovely florals you've created, must admit those daisies caught my eye when I browsed at the release. Great the way you created your own strip for a background, really funky. Beautiful cards, all of them! I really like how you striped the background and your colors are just gorgeous. Beautiful cards and I love all the colors you used. The stripe background is so pretty with the flowers and the daisies are so cherry and pretty. Beautiful job. Beautiful daisies and I LOVE the striped background! Oh my goodness! Such wonderful and beautiful cards and the colors are lovely and unique! In Love with these! Love your first card with the daisies...although, I love all your cards, the first one is my favorite. I can't believe that impression is just from stamping. It looks like it was colored. Very pretty stamp set. Good job with the colors!-Maria Giselle B.
I feel like I can SMELL those flowers!! Especially on the multi-color one. SO BEAUTIFUL!!! This is a gorgeous release. Love the colors and designs on these beautiful floral cards. All beautiful cards and beautifully stamped and designed. Love the striped background on your second card and the bright fresh colours on your third. I love that you showcased how to get the stripes without masking! All the cards are beautiful! Love this stamp set. It is absolutely stunning! Beautiful cards! I just love how you used the stamps in combination to make gorgeous looks. Very excited that I purchased them so I can recreate the cards in some way. Thanks for the inspiration. Loving that one with the stripes!!! I love your cards, especially the one with the stripes! Love these cards!! The striped background is so lovely. thanks for the inspiration. Oh my goodness ! Your backgrounds are absolutely stunning ! 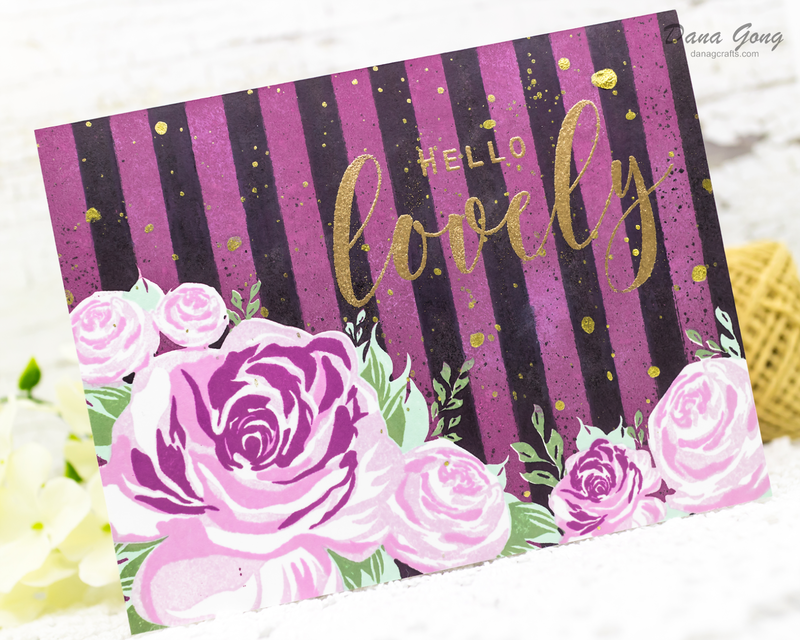 Fabulous floral cards! Love each one and your beautiful color combos! Lovely designs! I love the striped card, wonderful idea. So beautiful! Love the stripes! These are all cards I'd love to make! The striped black and purple background is amazing - very elegant and eye-catching. Wow, work of heart! Super gorgeous! The daisies are lovely!! I'll admit it... I didn't have the peony notes on my wishlist until I saw this card!! What an incredible background and I see how the set made it easy to do without having to mask the flowers! Such lovely cards! Those daisies are lovely. 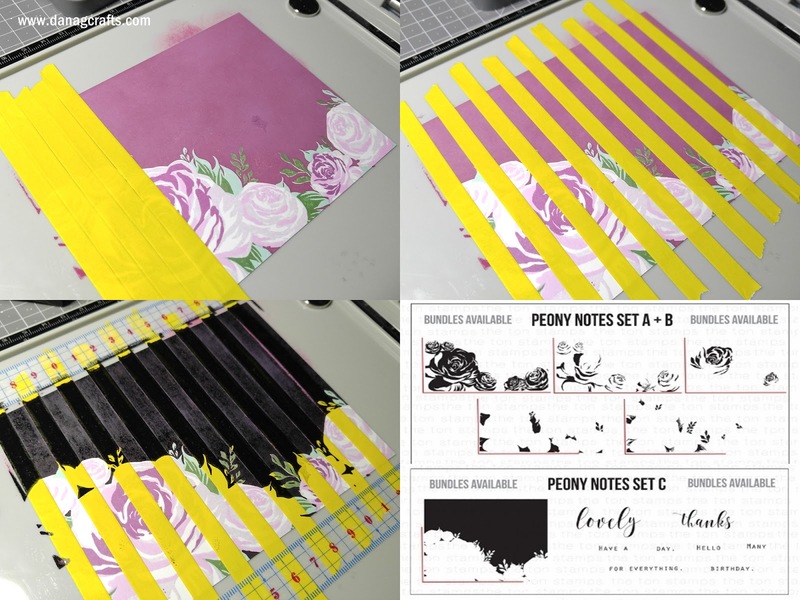 I love that background you have created in the peony notes card. So pretty. Your flowers are beautiful and I love the striped background. Fantastic cards! Well done on masking that striped background. It really adds a fun flair to that card. And I enjoy how you did the first sentiment in grey; that really lets the flowers take center stage even with such bold sentiment. I'll have to remember that for the future. Thanks for sharing with us! Very nice cards... I actually thought that the stripes were patterned paper at first glance. I really like your technique! Great cards! Thanks for some cool technique ideas! 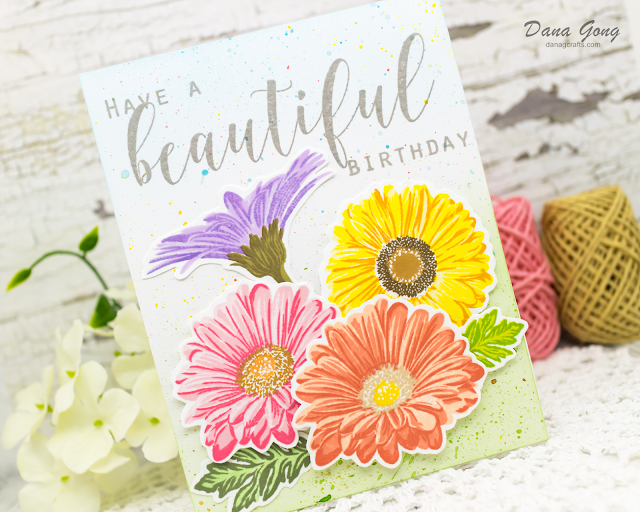 All your cards are lovely, but the first one is simply stunning - love the coloring and how you grounded the flowers...nicely done!!!!! Wow! Your cards are stunning. Love your color choices and compositions. The striped card is a real knock out! Thanks for sharing your creativity and inspiration. Those are all amazing! I'm stunned by your creativity! GORGEOUS cards! I especially love the striped card, great technique for the background! Wow amazing cards! The second one is stunning! Such pretty cards! Your daisies are fabulous! Love the cards! The striped card is so cool & I'm so glad u shared how you made it. The daisies have my heart tho. They are gorgeous!! What a gorgeous collection of cards! I LOVE that purple one!! The stripes are fabulous! These florals are beautiful. And your striped background is just stunning! Thank you so much. I adore the multi-colored daisies! Your cards are fabulous! I really like how you did the striped background on the 2nd card. The peonies card is sooo pretty.. loved the technique and the versatility of the flower bouquet! Love the striping on the purple card.